Originally posted: February 1, 2017 . Last modified: April 20, 2019 . A bold and refreshing cocktail made with raspberry Chambord, tart citrus vodka, and crisp tonic water that awakens your senses and tickles your taste buds. *This post was written in partnership with Drizly. We received a gift card to purchase the product. All opinions are our own. I am not sure what’s been going on with me lately. It seems my mind has been focused on Valentine’s Day for weeks. Which, is unusual for me as I have always struggled with the holiday in the past. However, over the last year or two, I find myself drawn towards wanting to celebrate it with Kim. I wonder if it has to do with growing into adulthood. Perhaps, it is a byproduct of a long-term relationship. In other words, as the years go by, I find myself more and more in love with my wife. Either way, it seems after all these years, I‘m a romantic at heart. Fortunately, cooking is an outlet in which I can express those feelings. So, when Drizly approached us about a partnership, I quickly accepted another opportunity to make something special for Valentine’s Day. If you prefer an after dinner drink, then try this hazelnut coffee. This drink recipe is solely dedicated to Kim. I went to Drizly’s website and discovered they were an online liquor store with delivery options. The selections were amazing, and they offered just about any beverage you could want to build your wet bar. After much self-deliberation, I finally decided on what I should make for Kim. Every flavor was picked because I knew it catered to her tastes. From the fruity Chambord to the tart citrus vodka, each ingredient was selected for her enjoyment. The only tricky part was determining the correct amounts of each liquor. Once again, Drizly came through for me because they have a space dedicated to recipes. It didn’t take long for me to peruse a few recipes and determine the right mixture amounts for my concoction. Putting together a Chambord citrus tonic is easy. All you need to do is add ice to a shaker or mixing cup. Afterward, add the Chambord, vodka, and tonic water. Then give the mixture a quick stir. Finally, pour the drink into a cocktail or martini glass and serve chilled. That’s it! Want more drinks? We also have a nice Vodka Cranberry, a Maple Old Fashioned, and a Champagne Grenadine Spritzer. In a shaker or mixing cup, add ice, Chambord, vodka, and tonic water. Pour into cocktail or martini glass and serve chilled. Wow this looks delicious! Perfect for when I have friends over for drinks! This looks good. You had me at vodka, lol. 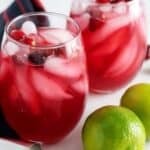 Seriously, I’m not a big drinker, but I love a good cocktail. Thanks, Rachel! Once the baby is born, you can enjoy all the drinks you want lol! This is a very sweet post 🙂 I don’t consider myself a romantic either but I do love a good drink. And this must be extra special, dedicated to your wife! Can’t wait to try it. such a refreshing drink! very pretty colors and gorgeous photos! Chambord used to be a go to for me, not sure what happened. I’m re-inspired! Love the narrative before the recipe. It’s inspiring. This looks delicious! I will have to try this for valentines day! YUM! 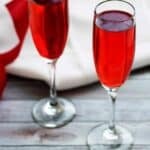 This looks like the perfect cocktail to make on Valentine’s Day. Thanks for sharing, I can’t wait to try it out. Simple and perfect for valentine’s day! This looks divine and perfect for Valentine’s Day! Adding it to my menu 🙂 Thanks for sharing! I love that you added some fresh raspberries. It added such a nice touch!